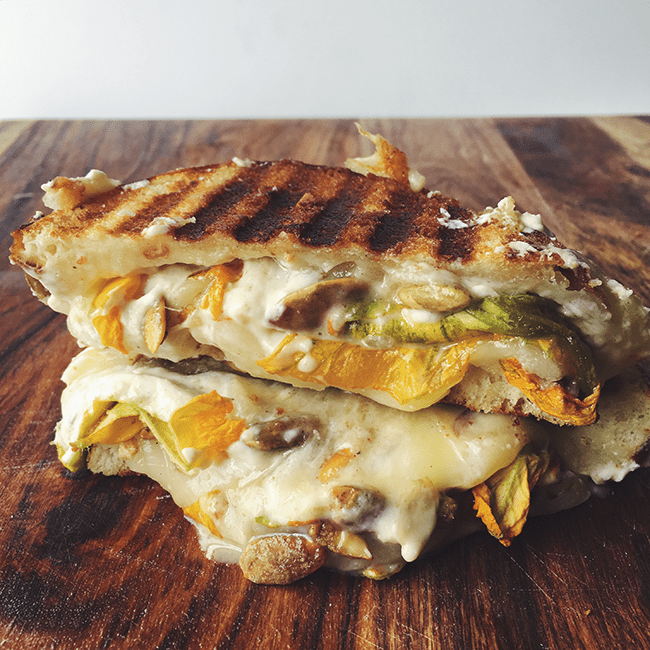 Image this, beautiful squash blossoms drizzled with honey and topped with candied pumpkin seeds layered between a toasted pretzel bun full of fluffy fresh ricotta, melted sharp cheddar, and truffled Taleggio cheese. This grilled cheese sounds pretty amazing, right? Yeah! Begin by slicing off the top exterior and the bottom exterior of your bun - as thinly as possible to expose the spongy part of the bread that's good at sopping up flavors. On the bottom bun, lay on a thin layer of cheddar, a smear of the fresh ricotta, and the candied pumpkin seeds. Gently tear open your squash blossoms and place them on top. Drizzle with honey and then top with the ​Taleggio. Finish by adding the top bun and then by buttering the exterior of the sandwich. Over medium heat, grill the sandwich in a cast iron or in a panini press until the cheese has melted and the bread has become golden and crispy. Wait a few minutes so that the cheese in the sandwich can thicken back up then cut it down the middle and serve immediately. We recommend having a little extra honey near by to dunk the sandwich in.